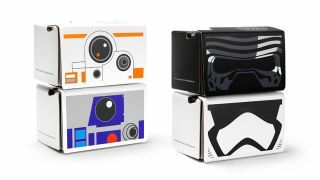 Were you fast enough to grab a free Star Wars Google Cardboard? Update 5pm PT: It looks like Google won't be stocking more Star Wars-themed Cardboards, so if you weren't able to get one, you're out of luck. "This is a limited edition item so we won't restock. Subscribe to our newsletter for future promos," Google replied in response to tweets asking if it'll restock. Still, there's a whole week left until the release of Star Wars: The Force Awakens, which is plenty of time for Google to maybe launch a different set of themed Cardboards. At least, we hope. Google held an impromptu giveaway of its Star Wars-themed Cardboard headsets this morning, but unfortunately, it didn't take long for them to run out of stock. Themed up to look like Darth Vader, R2-D2, BB-8 and a Stormtrooper, these Google Cardboard VR viewers landed alongside the first Jakku Spy VR clip on the Star Wars app two weeks ago, but only for US Verizon customers. Google opened up the giveaway this morning, announcing on Twitter, "These are the droids you're looking for. @starwars Cardboard now available on @GoogleStore." They were gone in about an hour after tweeting. Google's giveaway was only available to those in the US, and you could only order one per customer. Those lucky enough to order one also got free shipping. Of course, Google may restock the Star Wars-themed Cardboard again soon, so we recommend keeping an eye out here if you really want one, or tweeting your demand for one to Google, and hoping they listen. Meanwhile, there's only a week left until Star Wars: The Force Awakens hits theaters.